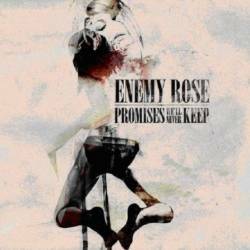 Enemy Rose from the Belgian city Antwerp have been founded in 2005. After a split-CD with the Mercy Killers, they are now ready to release their first long-player Promises We’ll Never Keep. Even though the five-piece is still young, the members have gained already experience in bands like The Heartaches, Smash My Radio and Smooth Lee. The fact that U.S. Bombs guitarist Kerry Martinez produced the album should give us already an idea what to expect. Rock’n’roll, New York punk and a lot of sleaze are the foundations of Enemy Rose’s sound. It is apparent that the guys had a good time recording the record, but in the meantime they must have forgotten how to surprise their audience. The CD start with Rattle The Cages, a two and a half minute piece reminiscent of Hanoi Rocks. The band also shot a video clip for that song. Basically their songs are all quite fast, have catchy choruses and a fair amount of snottiness. Especially Trigger has all it takes to become a hit. The band aims for variety with Buried Alive and Bleed, two more sentimental songs. Tainted (With Regret) is even a regular ballad, in the vein of Eighties sleaze rocker Faster Pussycat. Promises We’ll Never Keep is far from being exceptional, but the optimal running time prevents boredom to arise, making this a fun listening experience after all. Fans of party compatible rock bands like U.S. Bombs, Hanoi Rocks, Backyard Babies and the Stooges should get wholesome fare with this album.